Very Clean With Low Miles. Z71 4X4 One-Owner, Clean CARFAX. Power Sunroof, Heated Seats, Rear Back-up Camera, Leather Interior, Bluetooth Hands Free, 4X4, Tow Package, Park Assist, Adjustable Pedals, EcoTec3 5.3L V8, 110-Volt AC Power Outlet, 150 Amp Alternator, 20" x 9" Polished Aluminum Wheels, 4.2" Diagonal Color Display Driver Info Center, 6" Rectangular Chromed Tubular Assist Steps, All Terrain Chrome Bumpers Package, Auto-Dimming Inside Rear-View Mirror, Auxiliary External Transmission Oil Cooler, Chrome Door Handles, Chrome Front Bumper, Chrome Rear Bumper, Deep-Tinted Glass, Dual-Zone Automatic Climate Control, Electric Rear-Window Defogger, Electronic Autotrac Transfer Case, Enhanced Cooling Radiator, EZ Lift & Lower Tailgate, Front Halogen Fog Lamps, Heavier Duty Rear Springs, Heavy-Duty Rear Locking Differential, Hill Descent Control, Increased RGAWR, Integrated Trailer Brake Controller, Leather Wrapped Steering Wheel w/Cruise Controls, LED Cargo Box Lighting,Max Trailering Package, Off-Road Suspension Package, OnStar 6 Months Directions & Connections Plan, OnStar w/4G LTE, Power Adjustable Pedals, Power Folding & Adjustable Heated Outside Mirrors, Power Windows w/Driver Express Up & Down, Preferred Equipment Group 4SA, Rear 60/40 Folding Bench Seat (Folds Up), Rear Bumper Cornersteps, Rear Vision Camera w/Dynamic Guide Lines, Rear Wheelhouse Liners, Remote Keyless Entry, Remote Vehicle Starter System, Single Slot CD/MP3 Player, SLT Crew Cab Value Package, Steering Wheel Audio Controls, Theft Deterrent System (Unauthorized Entry), Trailering Equipment, Ultrasonic Front & Rear Park Assist, Universal Home Remote. 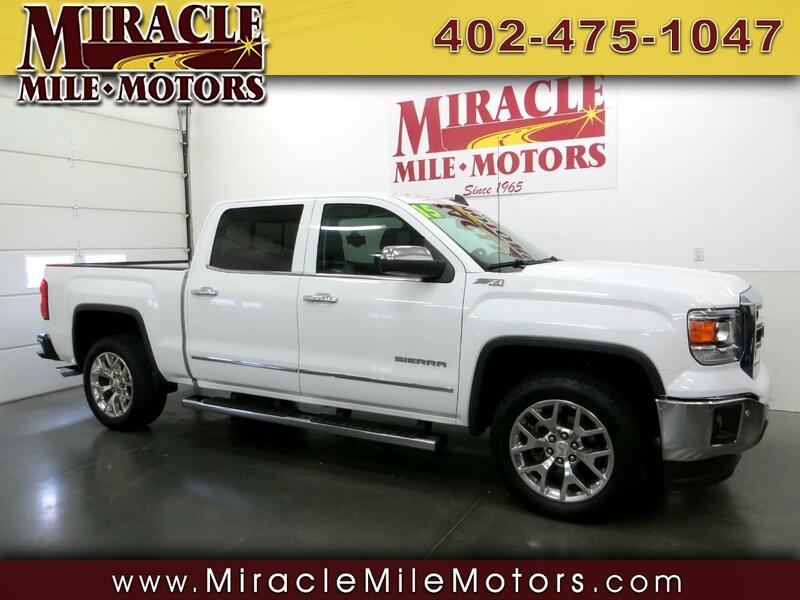 2015 GMC Sierra 1500 SLT Z71 4D Crew Cab 6-Speed Automatic Electronic with Overdrive 4WD EcoTec3 5.3L V8 Miracle Mile Motors in Lincoln NE have been in business for over 50 years selling premium quality used cars, trucks and SUV's vehicles. We are committed to save you time and money and make your buying experience hassle free and pleasurable. All of our prices are clearly displayed on each vehicle. We offer bank financing , service contracts, and Carfax reports. NO DOCUMENTATION OR HIDDENS FEES. Word of mouth is our best advertising. Please look thru our inventory at www.miraclemilemotors.com or e-mail with any questions. 1-888-465-8963 87th & Hwy 2 Lincoln, NE 68526 Where Friends Tell their Friends to Buy CarS. Recent Arrival! Odometer is 7810 miles below market average!